Violence occurred after far-left and Islamist groups defied ban on demonstrations; synagogue and police station also attacked. 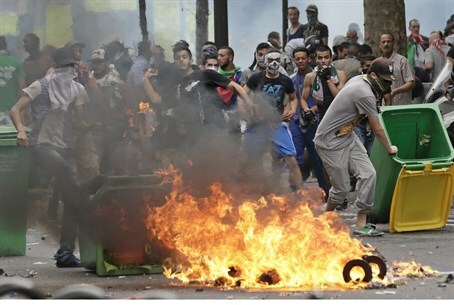 Footage has emerged of anti-Israel protesters rioting in Paris as they fought running battles with French riot police Saturday. The violence came as far-left and Islamist extremists defied a ban on protests over the conflict between Israel and terrorist groups in Gaza, after a previous anti-Israel rally turned ugly when hundreds of extremists marched through a Jewish neighborhood shouting anti-Semitic slogans and attacked a synagogue. Dozens of Jewish youth mobilized to fight back and managed to hold off the attackers until police arrived. French authorities responded to the violence by banning further demonstrations in a bid to calm tensions, despite fierce criticism and accusations of stifling free speech. French President Francois Hollande defended the move, and threatened that "those who want at any cost to protest will be held accountable." On Saturday, extremist groups including the far-left New Anticapitalist Party took to the streets of the French capital despite the ban and wrought havoc in the Barbès in central Paris, confronting police with serious violence. At least 33 people were arrested for throwing projectiles and assaulting police, according to the Wall Street Journal, and several people were injured in the clashes. Police responded by firing teargas and rubber bullets. Apart from fighting with police, extremists also caused considerable damage to property in the area and even managed to briefly storm a police station; at some points rioters can be seen literally tearing up parts of the road to gather chunks of tarmac to hurl at police. Also on Saturday, anti-Israel rioters once again attacked a synagogue in Paris's Sarcelles neighborhood, hurling a molotov cocktail in a failed attempt to set it alight. The firebomb caused light damage to the building, but attackers did not manage to break into the synagogue after Jewish youths mobilized to protect it, some of them wielding iron bars and other makeshift weapons to fight-off the assault.